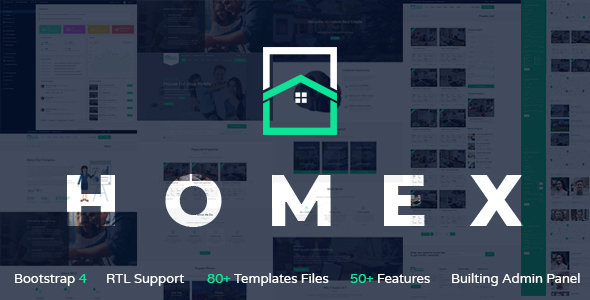 Homex is a Real Estate Template. It’s create in twitter Bootstrap4 version. Lot’s of important pages and features include here. Specially we added user control panel or use admin panel design. Homex include property map view system and property popup on google stylist map. Homex is completely responsive and W3 school validate. Different style property grid system design. In this design we added different type of property search style first time. So you can get option what type of search system you would like to develop and keep in your website. Homex have lot’s of pages and it’s very easy to customize. You can create new element and pages using it’s features and sources. The template is very fast loading. It’s pass google website speed test score 86/100 Homex is all browser comfortable. It’s support most usable browsers. We continue to update home and will include more features. 1200px bootstrap grid system used. Pixel Perfect Multipurpose HTML5 Template. Easy font awesome icon use. PHP email function include with contact form. Homex can be bought only on Envato Market. We belief support is very important after purchase a template. Because every client will customize the template or template with in a time. So they can face problem when customize and need to get information from author in time. That’s why we keep the quick time support and 3 type of support.